In 1969, a new single-seater race series was introduced to British motor racing to provide a fast and attractive alternative to the increasingly exclusive and expensive Formula 1 machinery. Formula 5000 cars – the American equivalent was already known as Formula A – were similar to their F1 brethren but powered by stock-block engines of up to 5 litres, mostly American V8s although 3.5 litre Rover units also appeared in a few cars. The opening two rounds of the Guards Formula 5000 Championship were held over the Easter weekend, the first at Oulton Park on Good Friday, the second at Brands Hatch three days later. Both were won by Peter Gethin in the works-supported McLaren M10A entered by the Church Farm Racing Team. In 1964 I managed to get the company that I worked for to sponsor me and a car (mini) but being a BMC dealer I had to work on Saturdays so various circuits that operated only on that day were out of reach for me, Oulton Park being one. Towards the end of 1968, I approached the ultimate boss of the group of companies that I worked for, Sir Alfred Owen, and explained that the new Formula 5000 series was to start in 1969 and because of a shortage of stock block 5-litre V8 engines the organisers had put in a class for cars up to 2 litres to make up the numbers. Earlier in 1968 one of his BRM P261s had returned to Bourne from the Tasman Series [in Australia and New Zealand] and with slight modifications to the 2.1 litre V8 engine, reducing the capacity to 2000cc, and [some changes to] wheels and suspension it would qualify. As a trial run, Ian took the car to a BARC club meeting at Oulton Park on 15th March and, in damp conditions, won the last race of the day. Nearly three weeks later, he was back at Oulton Park for Thursday practice for the Good Friday race. He was eighth fastest, starting from the third row of the grid. By lap seven, the BRM was up to sixth place but then, turning into the ultra-fast Island Bend, the back end of the car suddenly slid wide. 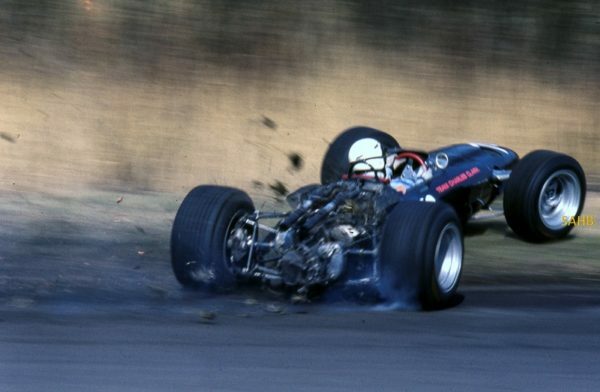 With the front wheels on the grass on the inside of the corner and travelling sideways at well over 100 mph, he fought to regain control, finally bringing the car to rest at the next corner, Esso (now Shell Oils) Bend. An oil pipe had fractured and liberally sprayed the rear tyres with lubricant so Ian’s race ended there and then. I had positioned myself on the outside of Island Bend and was busily capturing colour photos of these new, high-winged racers with a longish (for those days) lens and had just moved a little further round the bend for some different views when the BRM came into view completely sideways. I had time for just one shot – no motor drive or ‘continuous’ shooting then – and fortunately, with the camera settings I was using, I was pleased to have caught some of the movement rather than simply ‘freezing’ the car so it looked stationary.
. . . the rear of the car was covered in oil from a broken oil cooler pipe when I arrived at Island Bend sideways with the power on, as you would in a mini, and you were there with your camera. I have managed a number of pints on the strength of [that] picture and my credibility for a short time increased!